Several years of supplying solar simulators to the automotive industry made Suntech’s founder Ingemar Nilsson think that more people should have the opportunity to enjoy the unique experience they offer. And, after watching a Swedish game show give away trips to Mauritius, he decided to bring Mauritius to Sweden. 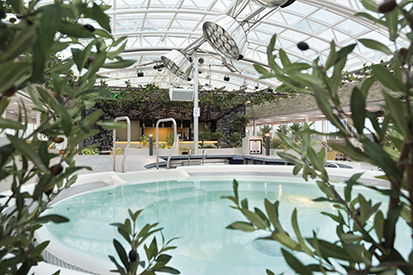 Care homes, spas and adventure pools are just a few of Suntech’s current clients. Today, their specially developed sunlight simulators and environments exist in over 250 facilities across 11 countries. “We provide a safe solar experience with light and heat, which improves wellbeing and promotes relaxation and new energy,” says Suntech CEO Inge Lojander. Suntech’s technology for sunlight simulation evolved from procedures for testing various systems and materials in the automotive industry in the late 1980s. Suntech’s founder had been asked to develop this expertise for the Swedish car brands SAAB and Volvo. “We have used the technology to test the tolerance of various materials to heat and sunlight in desert-like conditions,” explains Lojander. Suntech continues to provide this technology for several automotive brands today. Nilsson soon realised that this technology could be used in other contexts and began to investigate how he could bring it to a wider audience. “The vision was, and still is, to create a safe way to experience all the amazing benefits from sunlight through our solar simulators. In cooperation with the Swedish Radiation Safety Authority, a safe UV level was agreed and accepted and we were able to reduce the UV radiation to assure that the sunlight is at a controlled and harmless level,” Lojander says. The very first facility to try out Suntech’s product was a care home in the company’s hometown of Vänersborg. Suntech’s sunlight proved to have a very positive effect on the mood of the elderly. Staff also became healthier and had more energy to devote to their care and work, and sick leave was significantly reduced as a result. Experiencing the sun is not only a question of light but also of heat. “We provide both energising light and delightful nourishing heat,” says Lojander, explaining that a control system recreates the daily time variations in sunlight and visitors can experience a full day in a shortened timeframe, from early dawn to sunset. Suntech has therefore recreated the whole solar spectrum. Over the years, Suntech has fine-tuned its concept and added further elements to the sunbathing experience, enabling vision, hearing, touch and climate to interact. Background sounds recreate an appropriate atmosphere for the environment, such as a tropical day, for example, for which breaking waves and palm leaves rustling in the wind are popular additions. Ventilation that feels like a soothing breeze can also be easily incorporated to provide an enjoyable and relaxing experience. Suntech has also created different scenography where panoramic pictures are a key element, helping to recreate the experience of an outdoor location. The company can even build pergolas and tavernas to help visitors reminisce about sunny places they have been to. “And sand!” proclaims Lojander. “Very often we build sandy beaches. We are happy to help our clients create an all-inclusive experience for their visitors,” he says. –	Experience has shown that absenteeism in companies and organisations can be substantially reduced by time regularly spent in a sunny environment. –	A period in Suntech’s sunlight provides the same positive effects as time spent outdoors under clear blue sky. –	The immune system is strengthened by sunlight, which also promotes blood circulation. –	A sunny environment complements business by promoting relaxation, wellness and health. –	The warming and relaxing effect of Suntech’s sun is well suited to a spa or wellness facility and encourages subsequent treatments such as massage. –	Complement your pool area with Suntech’s solar system and provide your customer with an extraordinary, authentic sun experience. –	Nature centres, sauna facilities, yoga or relaxation rooms, winter gardens, cafés or cruise ships – the sun fits in everywhere and no area is too small or too large!